Even though I know a vegetarian diet is better for the environment, I love cheeseburgers and a good steak every now and then. If I stick to grass-fed beef, can I live with myself environmentally? Yes and no, depending on how much imperfection you’re willing to tolerate. Calorie-forcalorie, an acre of land can feed more mouths growing vegetables and grains for direct human consumption that it can growing feedstock for farm animals that end up on our plates. But for years beef industry defenders have pointed to the “carbon sequestration” benefits of grazing cattle on grasslands as an environmental justification for continuing to raise and sell livestock. According to the theory, grasslands around the world hold the potential to store (sequester) enough atmospheric carbon dioxide (CO2) to reverse global warming if they are used to graze livestock “bunched and moving, as a proxy for former herds and predators”- in the words of “holistic management” guru Allan Savory - to mimic what were once naturallyoccurring processes in nature. Since grasses, like all plants, consume (and then store) atmospheric CO2 - a key component of photosynthesis - to grow to full maturity, using grassland to graze cattle helps sequester untold amounts of greenhouse gases as new grasses shoot up after the livestock has passed through. But a recent analysis by Tara Garnett and researchers at Oxford’s Food Climate Research Network found that the carbon sequestration benefits of even “holistic management”-based livestock grazing are limited at best. They concluded that, even under “very generous assumptions,” livestock grazing could only offset 20-60 percent of the average annual greenhouse gas emissions of grass-fed beef - and only between 0.6 and 1.6 percent of total annual greenhouse gas emissions. This last figure is the real clincher, given that livestock account for some 18 percent of global greenhouse gas emissions all told. Livestock agriculture - grass-fed or otherwise - is already a big contributor to global warming purely as a result of methane gas “emissions” from cattle. (Methane is an even more potent greenhouse gas than CO2.) All of this cattle belching and flatulence, combined with millions of tons of off-gassing manure generated on farms around the world, combine to make animal agriculture responsible for 35-40 percent of annual “anthropogenic” (human-caused) methane emissions worldwide. And it turns out that grass-fed cattle actually generate significantly more methane than their feedlot-held counterparts due to how difficult it is to digest wild grasses versus the corn- and soy-based feed offered back in the barn. Meanwhile, agricultural researchers are working on ways to reduce methane emissions even further for feedlot cattle by adding chemical and biological agents into feed that cancel out the “methanogenic” microorganisms that lead to intestinal production of so much methane in the first place. That said, environmentalists warn that we shouldn’t rely on such “interventions” when we can solve our problems the old-fashioned way: Reducing your overall intake of meat, if not going vegetarian or vegan altogether, is the only way to guarantee that our meat addiction doesn’t kill us in the end. CONTACTS: Food Climate Research Network, www.fcrn.org. uk; “Restoring The Climate Through Capture And Storage Of Soil Carbon Through Holistic Planned Grazing,” The Savory Institute, www.savory.global/wp-content/uploads/2017/02/ restoring-the-climate.pdf; “Carbon, Methane Emissions and the Dairy Cow,” Penn State Extension, https://extension.psu.edu/ carbon-methane-emissions-and-the-dairy-cow. EarthTalk is produced by Roddy Scheer & Doug Moss and is a registered trademark of the nonprofit Earth Action Network. To donate, visit www.earthtalk.org. Send questions to: question@earthtalk.org. 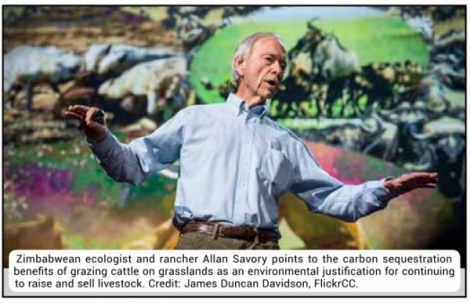 Caption: Zimbabwean ecologist and rancher Allan Savory points to the carbon sequestration benefits of grazing cattle on grasslands as an environmental justification for continuing to raise and sell livestock. Credit: James Duncan Davidson, FlickrCC. The Environment-Meat ConnectionParis Climate TalksGlobal Warming SolutionsDear Earth Talk: Fight Climate Change With a Fork! Dear Earth Talk: Dear Earth Talk:This Month´s Topic: Sweden´s Environmental LeadershipTeaching kids to consumeFinding "Green Job"